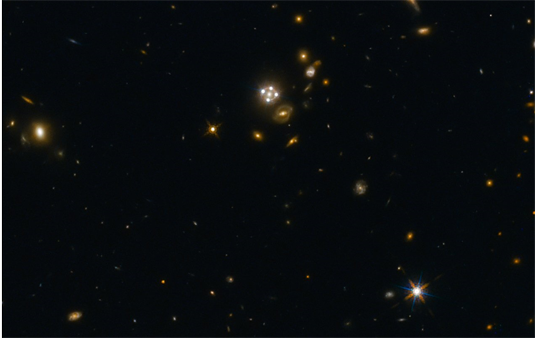 Using galaxies as giant gravitational lenses, an international group of astronomers, including a member of the Excellence Cluster Universe at LMU, has carried out a new and independent measurement of the rate of expansion of the Universe. Lensed quasar and its surroundings. Source: ESA/Hubble, NASA, Suyu et al. The Hubble constant — the rate at which the Universe is expanding — is one of the fundamental quantities that describe our Universe. A group of astronomers from the H0LiCOW collaboration, led by Sherry Suyu from the Max Planck Institute for Astrophysics and including LMU astrophysicist Stefan Hilbert, has now determined the size of this parameter based on observations of five selected galaxies with the NASA/ESA Hubble Space Telescope and other telescopes in space and on the ground. The new measurement is completely independent of — but in excellent agreement with — earlier estimates of the Hubble constant that used Cepheid variable stars and supernovae as points of reference. All of these measurements refer to what astronomers call the local Universe, which encompasses galaxies out to a distance of approximately 10 billion light-years. However, the new value obtained by the H0LiCOW collaboration, like those measured using Cepheids and supernovae, differs from that determined by the ESA Planck satellite. — But here an important distinction must be made: Planck measured the Hubble constant for the early Universe by observing the cosmic microwave background. Furthermore, the value determined by Planck is in accord with our current understanding of the cosmos, while the values obtained by the different groups of astronomers for the local Universe disagree with our accepted theoretical model of the Universe. “The expansion rate of the Universe can now be measured in different ways with such high precision that actual discrepancies may possibly point towards new physics beyond our current knowledge of the Universe,” elaborates Suyu. The targets of the study were massive galaxies positioned between Earth and very distant quasars, which are incredibly luminous galaxy cores. The light from the more distant quasars is deflected and focused by the huge masses of the intervening galaxies as a result of strong gravitational lensing – an effect first predicted by Swiss astronomer Fritz Zwicky 80 years ago. This creates multiple images of the background quasar and its host galaxy, some of which are smeared into extended arcs. Because galaxies do not create perfectly spherical distortions in the fabric of space and the lensing galaxies and quasars are not perfectly aligned, the light from the different images of the background quasar follows paths which have slightly different lengths. Since the brightness of quasars changes over time, astronomers can see the different images flicker at different times, the delays between them depending on the lengths of the paths the light has taken. These delays are directly related to the value of the Hubble constant. “Our method is the simplest and most direct way to measure the Hubble constant, as it uses geometry and General Relativity, but no other assumptions,” explains LMU’s Stefan Hilbert, a junior research group leader and member of the Excellence Cluster Universe.